Today, I brought out the really high tech stuff! A cookie sheet and a marker!!!! I found the cookie sheet at the dollar store, and use it for some magnetic activities. I found these great markers with the erasers on the ends at Office Max. The kids LOVE using these. I was able to use these two very simple items in some very different ways. The next objective we targeted was naming items in categories. 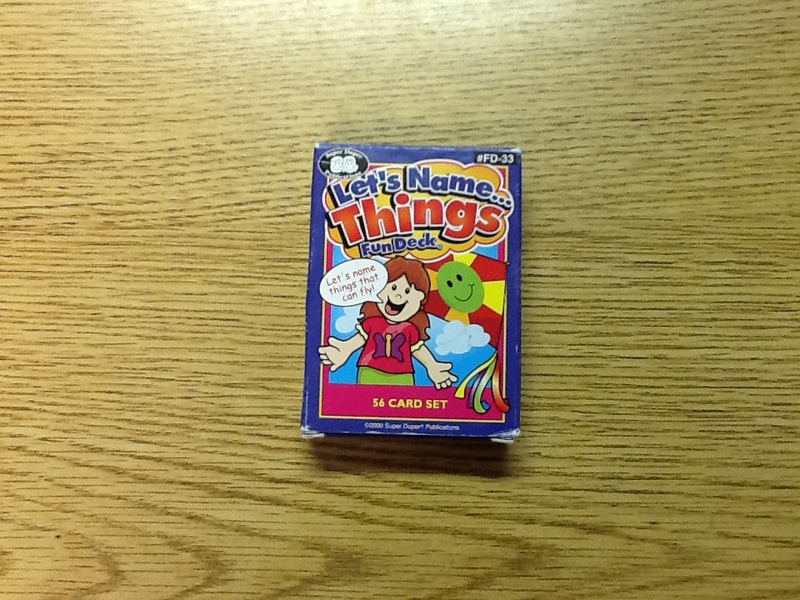 I pulled out my trusty "Let's Name Things" cards by Super Duper. I also pulled out a visual "spinner" from a board game that I have. 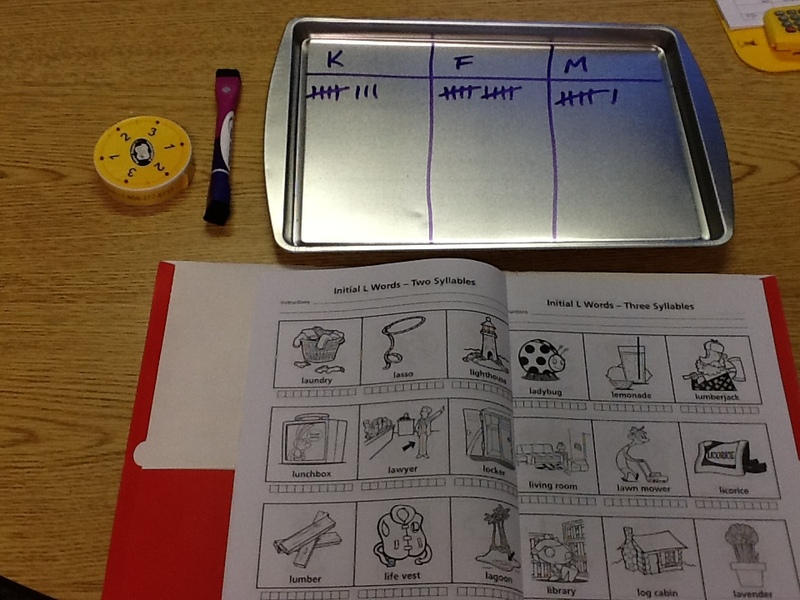 The student pressed the spinner to see how many items she needed to name from the categories on the cards. We wanted to get to 20 items. Every time she named an item correctly from a card, we drew a tally mark. She really loved counting all of the tally marks and keeping track of how many she had completed. She also loved erasing everything when we were done! The next group I had was an articulation group working on their sounds at the sentence level. We again used the spinner to see how many sentences they had to make on their turn. The goal was to get everyone to 20 sentences. They got a tally mark for every sentece they created. 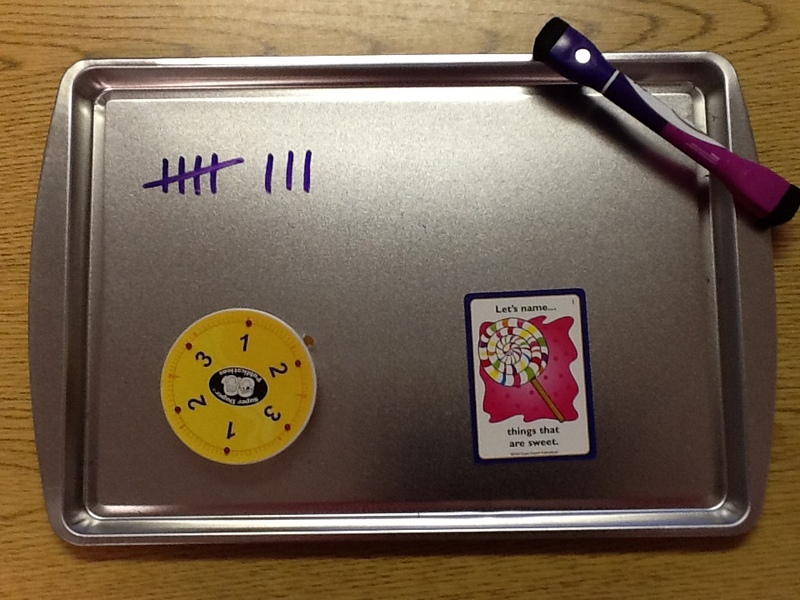 The students loved keeping track on the cookie sheet! They thought it was so cool to write on it! The last activity that I did with these materials was to target the prepositions above and below. I did this activity with a kindergarten student. I drew a "squiggly diggly" line down the middle of the cookie sheet. Then I wrote the words 'over' and 'under' for reference. 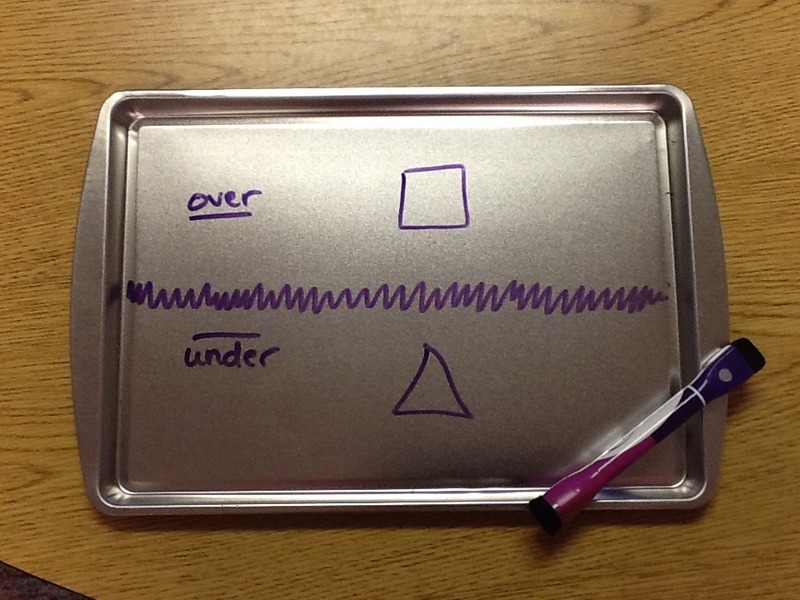 I was then able to draw a variety of shapes and different pictures over and under the line. I used this both expressively and receptively. He was asked to point to pictures that were above or below the line, and also asked to make sentences about the pictures. E.G. "The square is over the squiggly diggly line." My student was comletely cracking up about the "squiggly diggly" line! He thought is sounded so funny, and really motivated him. He was also really motivated by erasing the pictures when I was going to draw new ones. Overall, I had a fun day with students using a few really simple items! Love simple ideas! This is great. Thanks! While I love all TPT products, this is how my sessions usually run. I simple don't have time to print , laminate and cut! That was definitely the kind of day I was having! No time! Fun idea!! Thanks for linking up!! This is great! I'm in the process of moving and my speech materials won't be getting to back to me for months. I can do this one easily and with many of the kiddos on my caseload. Thanks! Great ideas even for adults!